In the past, Curtis has held the positions of Fire Chief, President, Vice President, and Director. 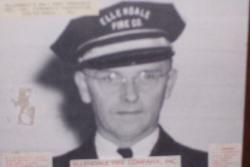 Curtis Ennis was Ellendale's longest serving fire chief, from 1934-1969. In addition, Curtis Ennis Sr. was the President of the Sussex County Fireman's Association -1945-1946, President of the Delaware Volunteer Fireman's Association -1954, President of the Delaware Chapter of the American Association of Firemen - 1956, and President of the Sussex County Fire Chief's Association -1958.